So, you’ve come up with a stellar business plan, the perfect company name, and purchased your website domain; the only thing left to do is get that logo and you’ll be in business! You’re in a hurry, which is understandable, starting a business or blog is so exciting and you’re probably eager to start turning a profit... However, don’t let excitement lead you to rush the design process! It’s true: it’s better to have your logo designed before you open your doors to clients but if you don’t plan to invest time and intention into your logo’s creation, you're setting yourself up to really hate the cornerstone of your brand's visual's aesthetic. Check out these top 5 reasons that entrepreneurs end-up hating their logos and take steps now to avoid them! This is the first and worst logo crime. As Ben Franklin said, “by failing to prepare, you are preparing to fail.” As trite as this saying is, it rings so true in this situation. The purposeless logo is a missed opportunity that will make you regret rushing to buy it. As the visual short-hand of your brand the shape, color, imagery, and typeface used to construct your logo should all be purposefully considered and selected to communicate information about your company at a glance. To avoid this issue, be crystal clear on the message you want to convey with your logo and be sure to define your brand before the first logo sketches are drawn. Download the brand questionnaire below to help guide you through the process of defining your brand! The "Inspiration board" is one of the most crucial elements in defining how your logo should look; Discover exactly how it works here! A well designed logo can be a huge asset to your company or blog, so why would you wait until the last minute to start crafting it? Or even worse just grab any ol’ logo? Your logo is an investment. Waiting until you're ready to launch to start designing it all but ensures that you're going to end up with something quick and cheap. The thing about visuals though: if it was cheap - it’s probably going to look cheap. Don’t get stuck with a logo that degrades your brand. Especially if you’re offering a high-end service. No one is going to take you seriously, if you show up to a job interview in flip-flops and jeans - don't settle for the flip-flops and jeans of logo's. Start talking to a designer right away - while you're still defining your business. Chances are, you're going to be able to clarify many aspects of your business just by going through the design process. You’ll start hating your logo pretty quickly if you go for something trendy or worse: generic. Remember the 3d effect? What about bevels? Aaah! I know: dated and ugly, right? Basically if the only good thing about your logo is that it "looks like a logo," (read: generic) then you've got a trendy logo that completely misses the mark on what a logo is actually supposed to do. If you’ve done your homework and defined your brand, you’ll be able to side-step this landmine with ease. You should have listed some brands that your brand wants to be like when it grows up. Think big companies like Nike, or Gucci, or Apple, or Starbucks. Take a lesson from their designs and stick with a logo that is simple, timeless, classic, and above all: unique and true to your brand. It makes my blood boil just thinking about it: the logo that only exists in a .jpg file!? Don’t get me wrong. JPG’s are great – for the internet and social media. If you ever need to have your logo printed though (like on product packaging or business cards), nothing will ruin your day like trying to print a JPG. The JPG file just doesn’t offer the crispness and detail of the vector file or even a 300dpi PNG. To keep your love affair with your logo going strong, make sure your designer knows that you want a printer quality PNG and vector file for your logo before you even start the design process. For more information about the various file types logos can be in and there uses, check out this article! Your new logo looks perfect! You’re so excited that you rush to post it on social media. That’s when the trouble starts: your logo is completely unrecognizable as the profile image of your business facebook page. "Well, that’s not too bad. I can get by," you think. At that moment, you receive an email from a publication that wants to feature you! How exciting! All they need is your logo file that will fit within specific dimensions for their magazine. You test it out and once again, that new logo is illegible and unrecognizable at that size. Take stock of where your logo will be seen and what sizes you’ll need it to fit into, before you begin designing. I usually provide 2-3 variations with the main logo design: a square or circular variation and a long horizontal variation; these are the most common variations you’ll need. Check out this article for more information on logo variations. If you’re still in a hurry to just grab a logo and go, understand that a re-brand is a last-ditch effort, not Plan A. If you start out planning to re-brand, you’re starting at a disadvantage and running the risk of attracting the wrong clientele. When paired with your other brand visuals, your logo is there to tell a story. “A picture is worth a thousand words” and that could not be more true, then with your logo. You can take paragraphs of space to tell your clients that you are a high-end luxury caterer who specializes in organic meals OR you can just show your audience – and your logo is the cornerstone of how you would do that. Purposefully constructing your logo gives you the power to “look the part” even if you're new to the industry. If you have a message that people are ready to hear, your logo is going to become the banner that represents that message. Taking the time to craft a lasting logo that you love ensures that you're ready for success. How did you beat them and create a logo you love? Need a little help defining your brand? 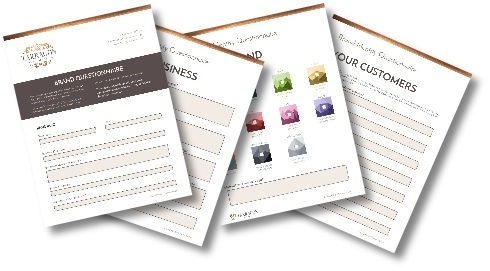 Sign up for your free Brand Strategy Session!